After several days of talking about lower budget Indie films I thought I’d jump tracks and look at the other end of the spectrum. 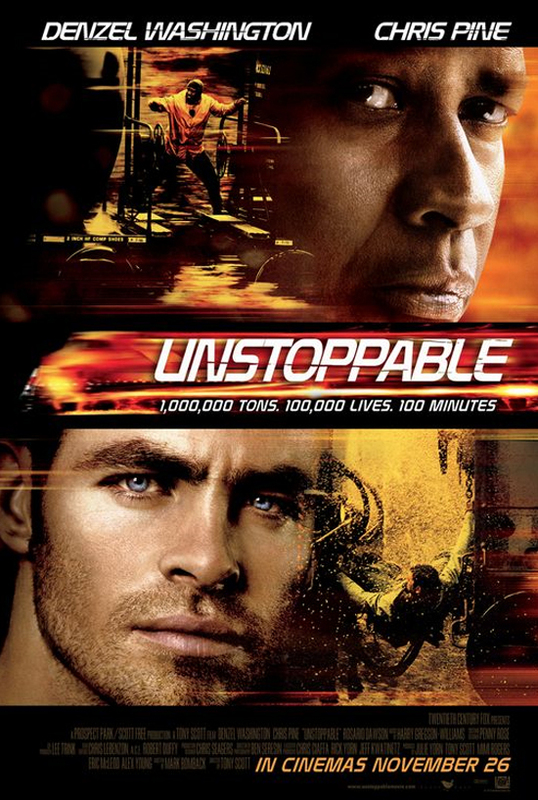 Unstoppable, which came with a budget of 100 million dollars, is a full-bore Hollywood film. I saw it last night and enjoyed the ride with the rest of the audience in the theater. In its simplicity it’s reminiscent to many films including Speed. In this case you missed the movie’s advertising, the story revolves around a runaway train. Simple, right? The film was shot in Ohio, Pennsylvania and New York. Since I’m a big fan of seeing parts of the country that don’t get much screen time, it was a fresh way to give a time-tested genre a new twist. The film was inspired by true life events regarding an unmamanned train incident known as the Crazy Eights incident in Ohio back in 2001. The script was written by Mark Bomback, who also wrote Live Free or Die Hard starring Bruce Willis. Bomback is a graduate of Wesleyan University where he was an English major. A couple of years ago Vanity Fair mentioned Wesleyan’s Entertaining Class and how the small Connecticut school “has turned out a shockingly disproportionate number of Hollywood movies and shakers” listing among its graduates, Akiva Goldsman (A Beautiful Mind), Michael Bay (Transformers), Matthew Weiner (Mad Men), and Sebastian Junger (The Perfect Storm). But back to Unstoppable, the movie. Unstoppable in its opening week has made back about a third of its production budget and is on track to break even in the states. But because it’s a universal action picture it will do well overseas it will probably cover it’s advertising budget and then some. Yay Ohio! It’s good to see the state in movies. I just moved back to Ohio from Arizona and was glad to hear they’re giving tax incentives to filmmakers. It’s good publicity for the state.